This is Hole-3 from The Autumn Tournament of APL CodeGolf. I am the original author of the problem there, and thus allowed to re-post it here. return (in any order) the list of unique positions (in the same format as the input) that knight(s) can be at after the given number of turns. 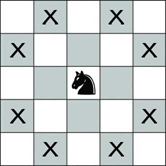 Each knight must move with every turn, but you do not have to worry about multiple knights occupying the same square. Takes 2 input, the first one is a list of numbers in range [1,64] describe the starting positions of the knight, the second one is the number of steps. AdjacencyList may takes a list of vertices on its right side, and return a list of vertices adjacent to any of those, already removed duplicates and sorted. KnightTourGraph is a builtin. Not surprise. Nest takes arguments in order Nest[f, expr, n], which we can splat the ## over its right side as Nest[f, ##]. And finally, Mathematica parse a~b~c~d~e as (a~b~c)~d~e, so no square bracket is necessary. Without infix notation and flatten ##, it would be Nest[AdjacencyList[KnightTourGraph[8, 8], #] &, #, #2]&. Input/output format: squares indices in [0 ... 63]. This snippet includes two helper functions to translate from and to the format provided by the OP. We apply this formula to each square p = 8y + x on the board and each knight square P = 8Y + X to deduce the new possible knight target squares, and recursively repeat this process n times. The input/output is the configuration of the board at start/end as a binary 8*8 matrix. Try it online! Takes input as an 8x8 board of :s with the knights marked with Ns, with a digit for the number of turns on the next line (it makes no sense to have more than 9 turns, but if you insist I can support it for an extra byte). Note that the output contains additional white space. Edit: Saved 45 bytes thanks to @MartinEnder. Explanation: The first stage converts the number of turns to unary, but using tab characters, so that they don't get matched later by accident, while the second stage adds some spaces to the right of the board to stop the regexes from wrapping across the edge. The third stage replaces all Ns and :s that are a knight's move away from an N with an n while the fourth stage deletes any remaining Ns, changes the ns to Ns, and subtracts 1 from the move count. This repeats until the move count is zero. 0-indexed coordinates. Almost certain this is suboptimal. Thanks to Emigna for saving 2 bytes! F                          # Do the following <input_1> times.. Which are the deltas of the moves of the knight. ʒ         #   Keep elements which..
Have to use a named lambda for the recursion. Not sure if that's disqualifying. Pass in starting positions as 0-indexed square number list. 0 counts as no moves. for(long a=p,i=p=0,j;i<64;i++)     // Declare variables, move p to a, create a new p and loop on bits of a.
for(j=64;j-->0;)                  // Loop on bits of p.
p |=                             // Assign to p a value.
? (a>>i&1)<<j                  // Assign the presence of the horse (i-th bit of a) to the resulting board (j-th bit of p). 19 bytes saved thanks to Nevay! 1 more byte saved thanks to Nevay in the new algorithm! 7 more bytes saved thanks to Nevay again by switching from int to 64-bits long. Uses 1-based indexing of squares and steps. Try it online! Argument is a pair, say p=[5,7]. Argument is a pair, say q=[3,8]. =5        Is it 5? Yes, so [3,8] is kept.
! Take n'th step of the iteration. u                   Remove duplicates, implicitly print. Input and output are 1...64 based. Takes a vector of position using the 1...64 notation. Maps it to a 1:576 notation, that is a super-board made of nine boards. In this notation, at each iteration, each knight should be able to move by +/- 22,26,47,49 Return future positions back in the 1...64 notation, excluding those that fall off the central board. The TIO example displays the result using an 8x8 matrix. Number of turns is through STDIN, and squares is an argument. This ties @HyperNeutrino's Jelly solution, but with a different approach. Now beating @HyperNeutrino by 1 whole byte! Any suggestions to knock off some bytes are wanted! Not the answer you're looking for? Browse other questions tagged code-golf chess board-game or ask your own question.